Nicorette Review and Results - Does Nicorette Work? Nicorette is a gum containing nicotine which is marketed as a stop smoking aid. Since Nicorette provides the user with low levels of nicotine, the use of the gum lessens the physical symptoms of nicotine withdrawal. Using gum rather than a cigarette also allows the nicotine to be delivered to the body at a less intense and slower rate, which gradually helps to reduce the cravings and other symptoms of withdrawal. The manufacturer of Nicorette advises that the product only be used by smokers who are motivated to stop smoking and must never be used in conjunction with smoking, as this can pose dangerous health risks. Individual plans vary, but in general, Nicorette users must chew at least nine pieces of gum per day, or one piece every 1-2 hours, for the first six weeks of the twelve-week program. Instructions for use include chewing slowly till the user notices a peppery taste or a tingling sensation in the mouth, at which point, chewing should stop until the taste or sensation subsides. Chewing Nicorette gum too quickly may cause overly rapid release of nicotine, which can lead to side effects such as hiccups, heartburn, nausea, or other stomach problems. Users should avoid food and beverages for fifteen minutes before using Nicorette. The gum is available in two strength levels: the 4 mg strength is recommended for smokers who use 20 or more cigarettes per day, and the 2 mg strength is for those who smoke less than 20 cigarettes daily. Nicorette gum's active ingredient is a nicotine-resin complex. Other ingredients may include chewing gum base, xylitol, sorbitol, peppermint oil, haverstroo flavor, menthol, sodium carbonate anhydrous, magnesium oxide, and glycerol. Nicorette gum is available from a large number of bricks and mortar retailers as well as many online merchants. While prices vary somewhat by flavor (six varieties are available: white ice mint, fresh mint, fruit chill, cinnamon surge, regular mint, and original) and among retailers, an average price for a box of forty pieces of Nicorette gum is $31.99. Generic versions of Nicorette gum are available at lower prices; for instance, a 40-count box of generic Nicorette-formula gum is $24.99 at Walgreens. The per-piece price is somewhat less expensive on boxes of one hundred pieces; for example, Target sells a 100-count box of Nicorette gum for $40.99. The recently developed white ice mint flavor of Nicorette offers teeth-whitening properties in addition to the delivery of low levels of nicotine. Online retailers often have lower prices for Nicorette products, but shipping and handling costs should be considered when comparing total prices among retailers. The cost of using Nicorette gum as an aid to stop smoking adds up quickly, since users must chew at least nine pieces daily for the first six weeks. The manufacturer must recognize this, since many versions of Nicorette coupons are available, ranging from simple dollars-off per purchase to a more complicated "Nicorette Quit Rewards" system, which offers progressively greater coupons as the user purchases more Nicorette gum, up to a $50 gift card after 750 pieces. The use of Nicorette gum to stop smoking has a varied level of success. 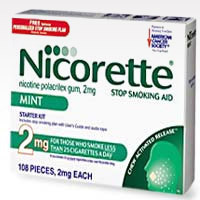 Some users were able to curb their cravings for cigarettes by using Nicorette instead, but suffered from side effects. Other users tolerated the Nicorette gum well, but noted that the product did not effectively diminish cigarette cravings. Still other customers were pleased that they achieved the desired results with Nicorette and had no side effects. There are many variables that contribute to these different results, including differences in metabolism, genetic makeup, and food interactions, and it is difficult to predict exactly how any given person will respond to Nicorette. Nicorette gum has had some success in helping users to give up cigarettes, but since the product contains nicotine, it is effectively just a method of changing the system by which nicotine is delivered to the body. Rather than continue to expose customers to health risks like cancer, heart disease, stroke, and Alzheimer's disease that are associated with the consumption of nicotine, we recommend an alternative product for stopping smoking such as NicRx, which contains all-natural herbal ingredients rather than just lower levels of nicotine. Learn more.